Find here free online math videos on measurement-related topics, meant for about 4th grade level: measuring length, weight, and volume, customary and metric units, temperature, and time units. I also have a separate page with measurement video lessons for grades 1-3, which are, obviously, simpler. ...as lesson plans for teaching these topics. Often, one video from below can be made into several lessons with students. 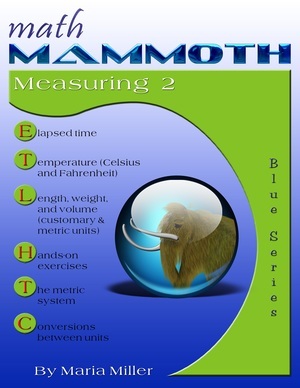 The videos match some of the lessons in my book Math Mammoth Measuring 2 (Blue Series book), or the lessons in chapter 4 of Grade 4-A (Light Blue series). In any of those books, you will get MANY more practice exercises, word problems, and puzzles than what are shown in the videos, and also some lessons that are not in covered in this set of videos. This is a lesson for about fourth grade level, where students are already familiar with centimeters and inches from the previous grades. I explain how to measure length with a ruler that has tick marks every 1/8 inch, and also with a ruler that measures in centimeters and millimeters. I also go through some conversion problems between centimeters and millimeters. I explain how to change (convert) between an amount in feet an inches, and inches, such as 4 ft 6 in to inches. Then, we do it the other way around: an amount in inches into feet & inches, such as 56 in. to feet and inches. We do the same with yards & feet to feet, and feet to yards & feet. Then I solve some perimeter word problems. Lastly I touch a little bit on miles versus feet. I explain the metric units for length from millimeter to kilometer on a chart. Then I solve some conversion problems, and lastly a few word problems. In the customary system, we have the units ounce, pound, and (short ton). I give some "ballpark" weights of various things, and then go on to solve simple conversion problems between the units and a few word problems. This lesson is intended for about fourth grade. We take a look at grams and kilograms for measuring weight in the metric system. I give some "ballpark" weights, and then we do some easy conversion problems. Lastly, I solve three different word problems -- the last one provided by Mathy, my mammoth mascot. The main units we use in the metric system for measuring volume are milliliter and liter. But actually there are two units between those: centiliter and deciliter. Then I solve some simple conversion problems between units, and several word problems. I compare Celsius and Fahrenheit scales for measuring temperature and give some ballpark temperatures for both. Lastly, I solve simple problems about rising or dropping temperatures using integers. A basic lesson about different time units (minutes, hours, days, months, years) for about 4th grade level. I solve a few conversion problems and several word problems involving time units.